When I told Keith, a.k.a. Mr Picky, what was for dinner this week, he said “Bless you.” You try saying it – Käsknöpfle – and see if you get the same response. Some words just sound like a sneeze, I guess. A free spirit, if you will. This recipe is for the days when you don’t want everything all wrapped up in a neat little bow. When you want things to be squiggly. And cheesy. And oniony. Trust me, it’s not too much to ask for. Just ask Liechtenstein. The fine folks of Liechtenstein recommend three cheeses… Fontina is creamy and has a bit of tang, Gruyere is salty and a bit drier (a bit reminiscent of Parmesan), and Emmenthalier is like a mild swiss cheese. All three have excellent melting qualities. 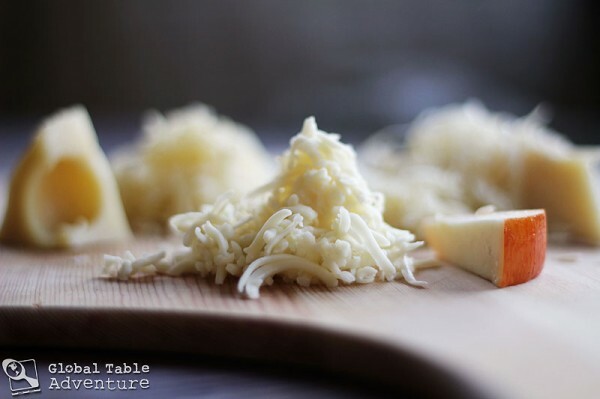 In a pinch, you can substitute any cheese that melts well. 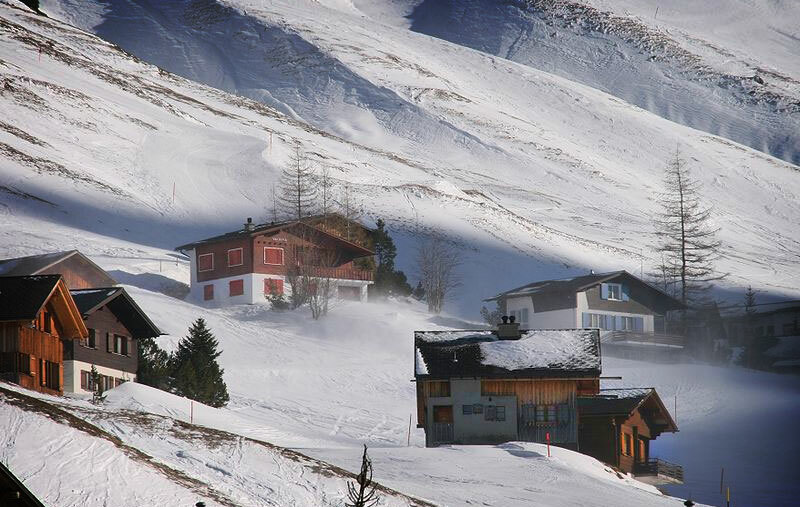 Malbun, Liechtenstein in winter. Photo by Friedrich Böhringer. 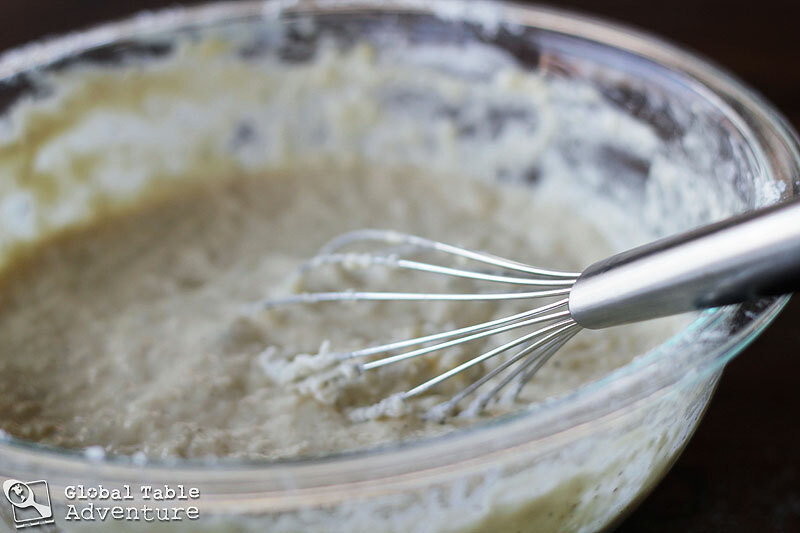 Whisk together the eggs, milk, salt, pepper, and flour. Pretend it’s a flurry of snow. Eventually a thick, somewhat pasty batter will form. In this case, pasty is a good thing. It’ll make the noodles perfectly… noodly… in texture. Set it aside for about 30 minutes to rest and let the bumps even out. Now, shred up the cheeses. You can easily add more cheese to this recipe if you want to take a walk on the wild side. I almost recommend it. After all, what is the world without extra cheese? Next, bring a large pot of water to boil. Add plenty of salt to the water and reduce to a simmer, then begin the process of making the Käsknöpfle. In the past I pushed the batter through the holes of a colander (please don’t laugh at my early photography… much). They also sell special spaetzel boards – you can use one of those, too. This time, I decided to push it through the dull side of a flat cheese grater with the back of a ladle. It worked very well. Once the squiggly pasta is cooked (it should only take a couple of minutes – they’ll float when ready), add it to the pan of caramelized onion with all the cheeses. You can cook and scoop (and cook and scoop some more), in batches,until the batter is all gone. Because that’s what they do in Liechtenstein. And they definitely know what they’re talking about when it comes to Käsknöpfle. Enjoy with a friend, an outrageous view, and a smile. 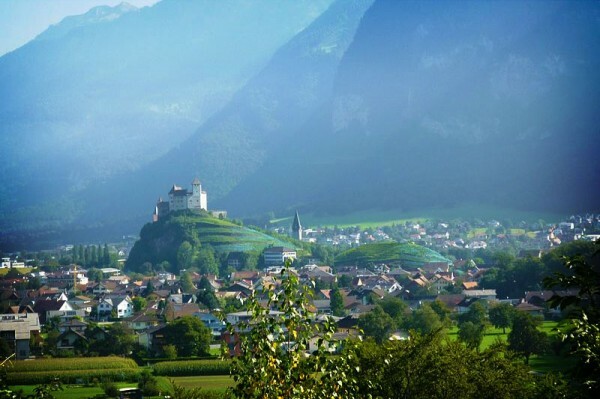 The castle Gutenberg in Balzers, Liechtenstein. Photo by St9191. This wonderful, cheesy pasta dish enjoyed in Liechtenstein is like mac and cheese, but all grown up. 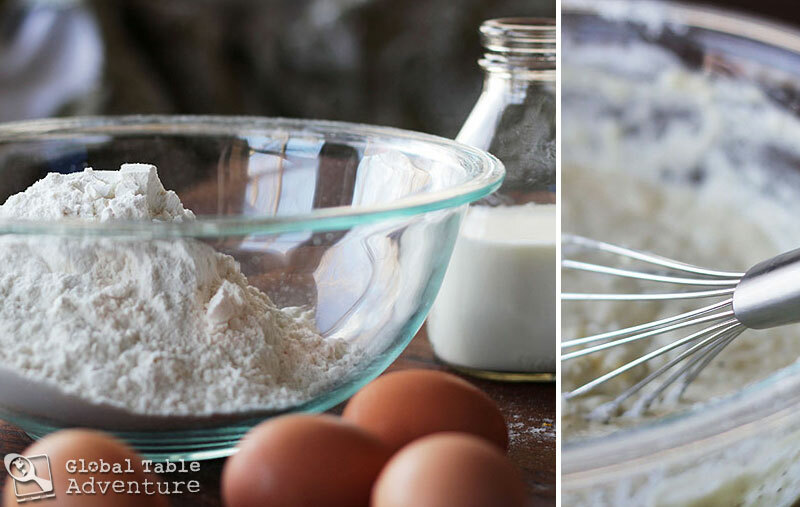 Whisk together the eggs, milk, salt, pepper, and flour. Eventually a thick, somewhat pasty batter will form. Set it aside for about 30 minutes to rest and let the bumps even out. 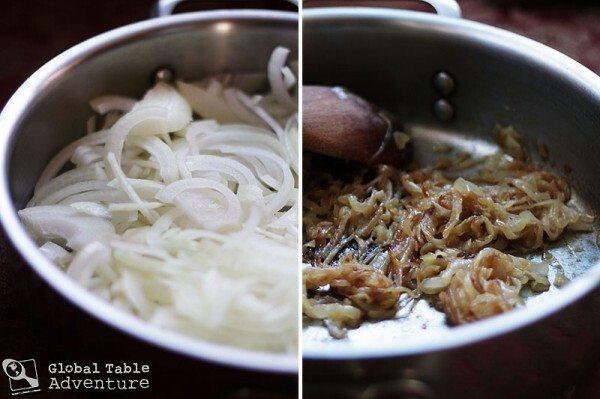 In a large pan caramelize the two onions. Bring a large pot of water to boil. Add plenty of salt to the water. Add cheeses to the large pan with the onions. 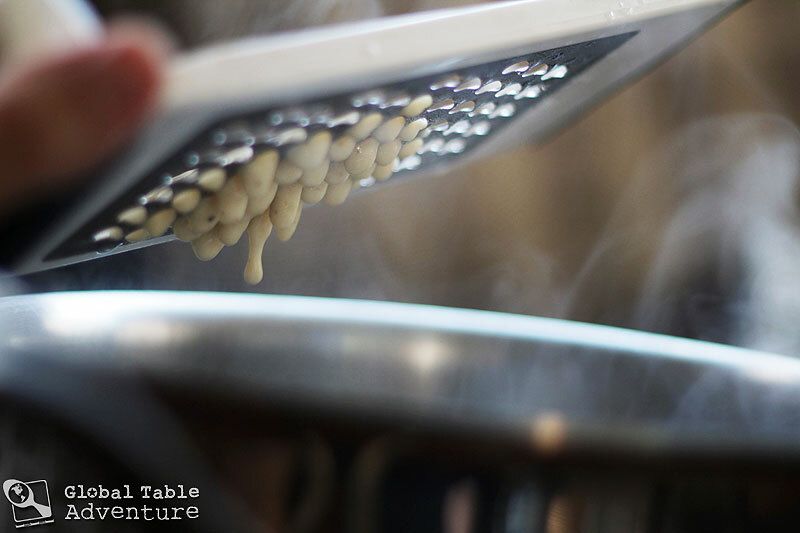 Push the batter through the dull side of a flat cheese grater with the back of a ladle into the simmering water. Once the squiggly pasta is cooked (it should only take a couple of minutes - they'll float when ready), add it to the pan of caramelized onion with all the cheeses. So…. if you love cheeeeeeeseee this is the way to go! The apple sauce side is interesting. Guess what I am having for dinner tonite?! The last photo reminds me of WHOVILLE! I just saw the Grinch a few weeks back! That last shot does look like whoville…..awsome….The rest of the photos are great. It’s hard to believe it even *exists*!! Such an amazing landscape…. I think I’ll try this receipt, the kids love Mac and Cheese plus it’s quick and easy. Glade you mentioned you can substitute different cheeses. Not sure if I could find any exotic flavors on the Eastern Shore of Virginia. That first picture reminds me of the mountain chalets in Heidi. Can you even imagine how much she and Peter and Grandmother would have loved this recipe?! My husband and I loved your interview with Rick Steve’s this morning. We got quite a chuckle from hearing that your 2 year old is using chopsticks! It reminded us of some of the wonderful foods that we’ve sampled during our travels. And then I thought, this is something that I can do when I retire later this year! 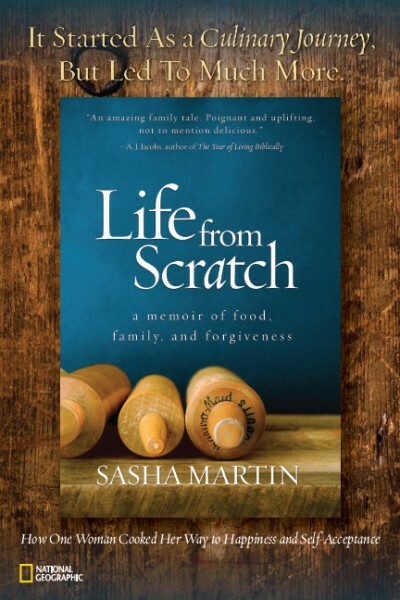 Having already set a goal to do more cooking and since we love to travel, this would be a great way to explore new countries and reminisce about ones we’ve already visited.. Thank you.! Just heard your call-in on Rick Steve’s radio show today. What a terrific idea! I will take more time to view your site, but already I love the photography – I am sure I will also enjoy the recipes! Thank you Mary – welcome & have fun exploring! I heard about this on the radio today with Rick Steve’s. What an amazing site. Great work! Thank you Luke – it’s a lot of fun and I love trying all the different dishes. I listened to Rick Steve’s program and went ahead and checked out your website. It is a great idea and the photos are incredible. I look forward to make a few of these. Rhadames, that’s wonderful. I hope you find something that whets your appetite. Happy Cooking! do the thumbs up made me think she might become a food critic ;). Just heard you on NPR! Congrats! I was on my weekend food shopping trip. What a beautiful idea you have brought to life and a wonderful site – I did pull off a little grin looking at your early photography – these pictures are great, I can see you’ve learned a lot in this area to. I am a budding food photographer and I so appreciate your attention to this part of it all. I’ll be back again and again. Look forward to learning! Looks great! We’re making it tomorrow night. Just heard about your site this weekend on Rick Steeves. We went to Turkey last year and took a cooking class while we were there. 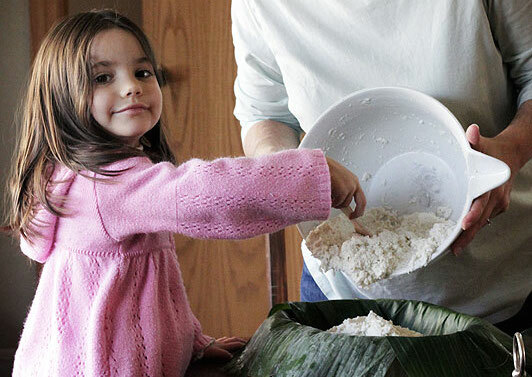 Looking forward to learning more about other cultures’ cuisine and trying new recipies through your site. Welcome Cindy 🙂 I would so, so, so love to take a cooking class while on vacation. I’m thinking Italy, although Turkey would fantastic as well. 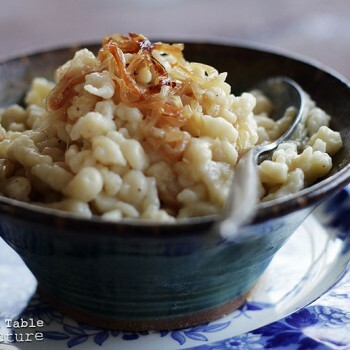 When I saw the recipe I thought this must be spaetzle… and it is. 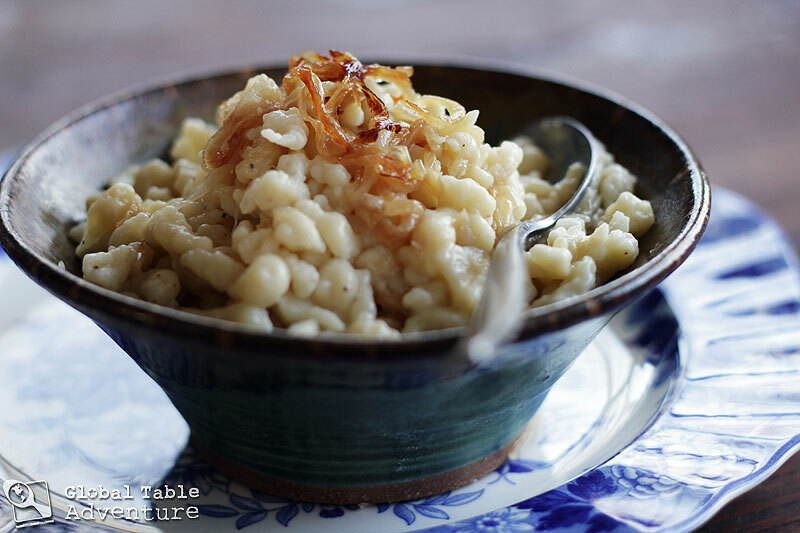 But spaetzle are really hard to make. 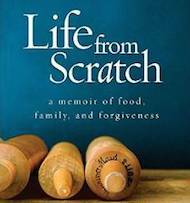 What if you are lazy and use elbow macaroni or fettucini or even spaghetti instead? I love your site! This is a great way to reach out in such a positive way. Keep up the good work and great food…I have a house of 7, so I may not be able to keep pace with you, but I will be trying as many of these recipes as I can make time for. Luckily, I work at a Trader Joe’s, so I should be able to get great ingredients for most of these. Thanks again for such a positive, peaceful place to share your food adventures! Yummmmmm. I made this for dinner last night. My husband and I loved it. Mixed reviews from my 7 kids. My 1 year old twins couldn’t get enough. The three in the middle, ages 3,5, 8, weren’t so fond of the cheeses-the 8 year scoffed because I wouldn’t let him bury it in ketchup like he does his Kraft Mac and Cheese. My 9 and 11 year olds thought it was great. The noodles were a bit messy to make-I had batter everywhere and my arm was tired of holding the colander up as I smooshed the batter through the holes. But the taste of the noodles was great. What a treat! I plan on making it for a cheese loving friend. How did you get this recipe? Very funny to read about a dish that’s so “regular” for us and yet such an art. Every family has its own “perfect recipe”. We use water, not milk. 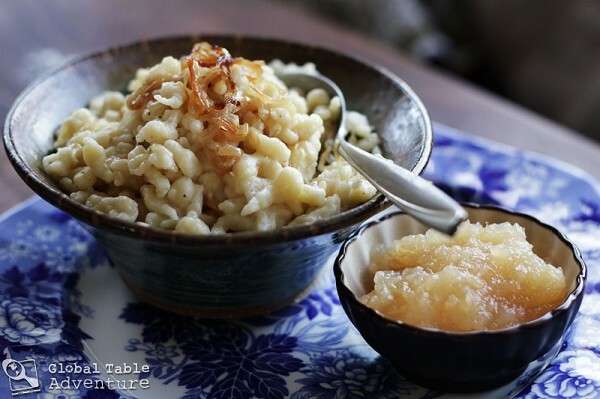 Also we use a good part of “sour cheese” – which is best if you buy it a few weeks before and let it ripen – it gets very stinky but is great with the Kässpätzle. thanks for your recipe! I am a foreigner live in Balzers, not too long ago have had this käsknöpfle, just love it.